My sixth ground of 2018 was on Friday 30th March at The Mill in Torpoint, Cornwall. 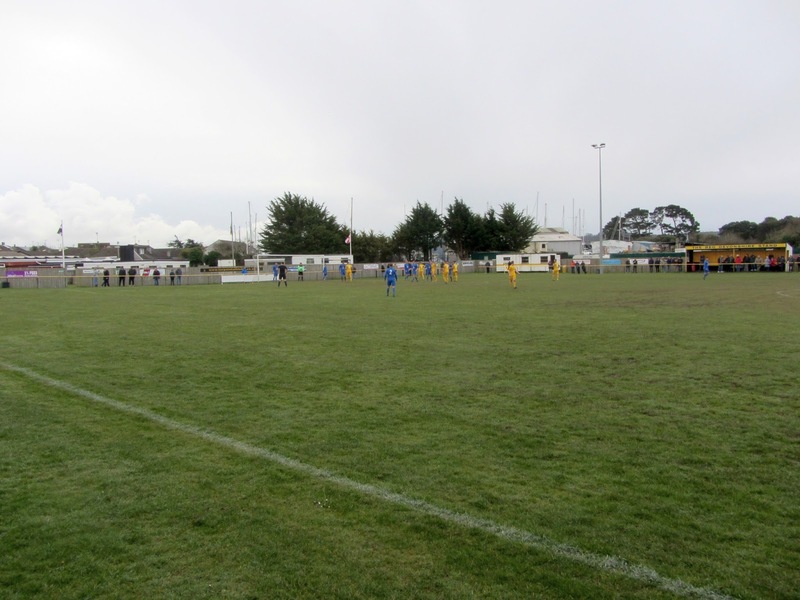 The match was Torpoint Athletic vs. Saltash United in the South West Peninsula League Premier Division. The Mill is in the south of Torpoint adjacent to one of the town's marinas. This marina is to the south-east of the complex with the rest of the eastern and northern sides sitting near housing. The remainder of the southern side and the whole of the western end see additional grass areas beyond the football field. The town does not have a railway station with the quickest transport link via the ferry across the River Tamar into Devon with Plymouth being the most convenient station some three miles east of the ground. The venue has been home to the club since 1971 when they left Defiance Field after an eleven year spell. The southern side of The Mill has the main stand, known as the Les Cardew Stand, by the half-way line. This structure has 74 seats across four rows and the two dugouts are either side of it. 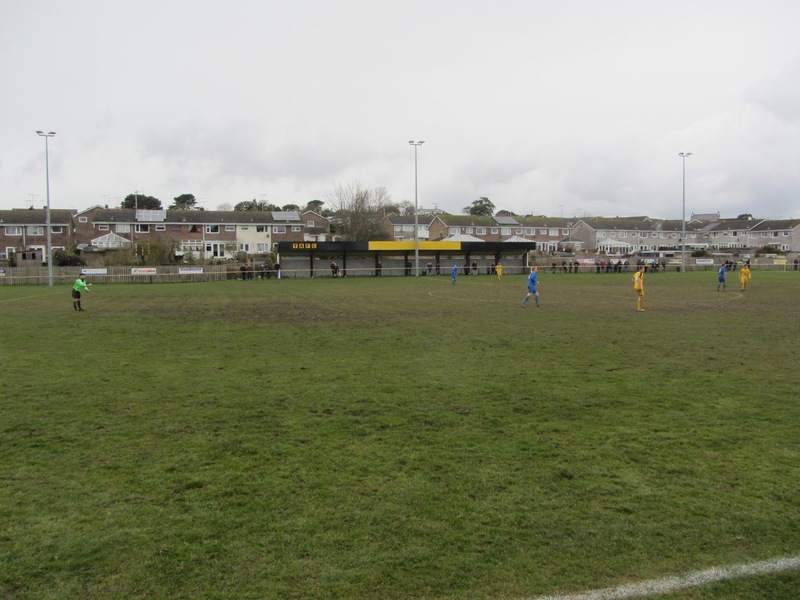 Towards the eastern end is the Reg Devonshire Stand which is a covered area consisting of four seats flanked by two wooden benches. The rest of this side is uncovered standing and there is an additional building called the Corner Flag Caterer in the south-east corner. The eastern end of the ground has the car park, a clubhouse and a demountable which serves as the player and officials dressing rooms. There is then a large grass area leading up a strip of hard standing behind the goal which runs for the whole of this end. The northern end of the venue has the only other pitch side structure - a covered standing area takes up the middle third of this section staddling the half-way line. The rest of this side and the entirety of the western end are uncovered standing. 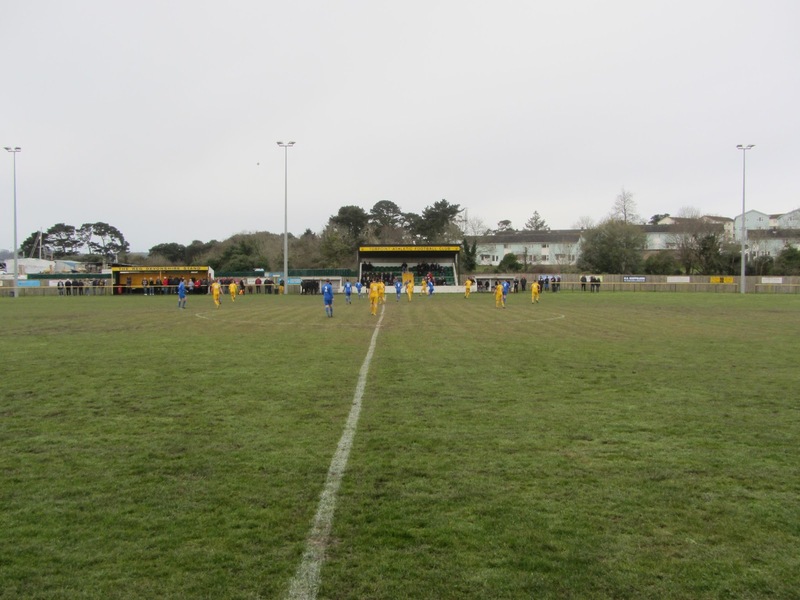 With the visitors unbeaten since early November they went into the local derby with high hopes against a Torpoint side with just one win in their previous seven league games. 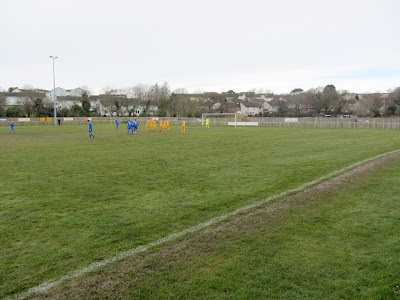 The game went to form early on as Saltash grabbed the lead in the 3rd minute. Sam Leary knocked the ball out wide to Paul Heveran in acres of space on the right wing. Heveran had plenty of time to pick out a cross into the six-yard box and Richard Maddison nipped in front of the keeper to poke the ball in. The away side should have scored again in the 17th minute when Sam Hughes' well-time run beat the offside line but with just the goalie to beat he dragged his shot wide. A few minutes later Lee Phillips had a similar chance but his shot was straight at the keeper. 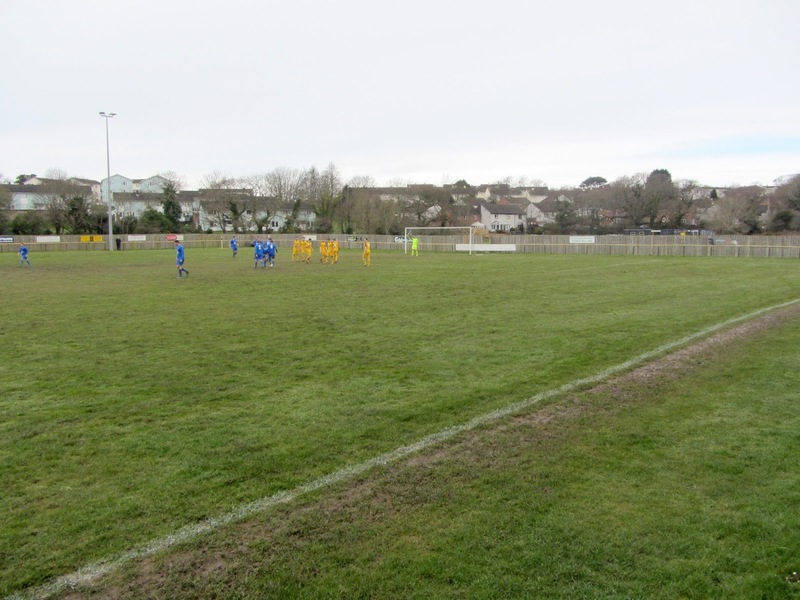 The post denied Saltash just before the half-hour mark as Callum O'Brien met a corner with a downward header which came back off the post. The hosts then had a good spell and equalised in the 37th minute when a corner found Darren Hicks at the back post and he headed in from a couple of yards out. 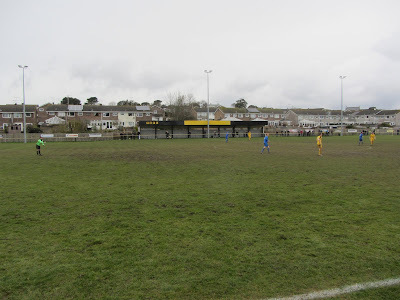 Into the second half and Saltash couldn't believe their luck in the 62nd minute when Sam Farrant's free-kick came back off the post, rebounded to Richard Maddison and he managed to hit the other post. The game was a really decent end-to-end encounter now but was getting increasingly tetchy. 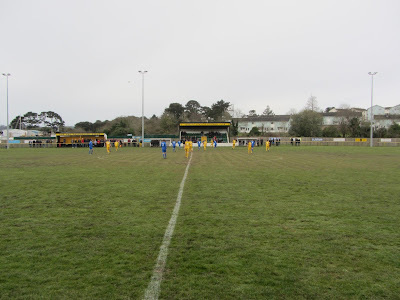 In the 83rd minute Torpoint's Lance Bailey came in with a late tackle on the half-way line and while everyone was expecting the referee to produce a yellow card, the colour was in fact red. A couple of minutes after this Saltash hit the woodwork for the fourth time on the day as Callum O'Brien's headed hit the crossbar. In the 95th minute the away side were reduced to ten men when a dreadful late challenge by Henry Wilson saw him deservedly get his marching orders. The drama wasn't over just yet though as eight minutes into stoppage time Lewis Edwards' cross from the right found Danny Lewis in the six-yard area and his point blank saved was acrobatically saved by the Torpoint shotstopper to rescue a point for his side in what had been an entertaining match.